Print & Go Character Graphic Organizer FREEBIE! 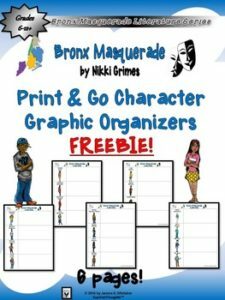 Enjoy this Character Graphic Organizer for use with Nikki Grimes’ vignette style novel Bronx Masquerade! Engage your students with this visual appealing, open-ended set of graphic organizers. Please check out all my Bronx Masquerade Resources and Activities!